My Brooklyn apartment needed some houseplants. . . finally. My wife and I moved in three years ago, but after a newborn, new car, changes in jobs, we are still asking questions like, ‘Um, where is that box of picture frames?' Our place is not too dark, but it’s not super bright either, and all the windows face north. This scared me at first—I wanted some success right off the bat to build my houseplant confidence. So I turned to a plant with a reputation for being hard to kill: the ZZ plant. "ZZ" stands for Zamioculcas zamiifolia. I promise I can pronounce the species name in person, but I’ll stick with ZZ plant here. The ZZ plant has been available as a houseplant for about 20 years, but it's getting more attention and appreciation recently. In fact, I first noticed it on a list of foolproof, low-light houseplants right here at bbg.org. Foolproof, attractive, tolerant of low light—it sounded like just the plant for my apartment. Still, I think of myself a good graduate of BBG’s horticulture certificate program, where we were taught to “know your plant.” So I did a little research. Most people seem to love the ZZ plant, but among the mostly positive things I read on garden blogs and other sites, a few snarky comments stood out. 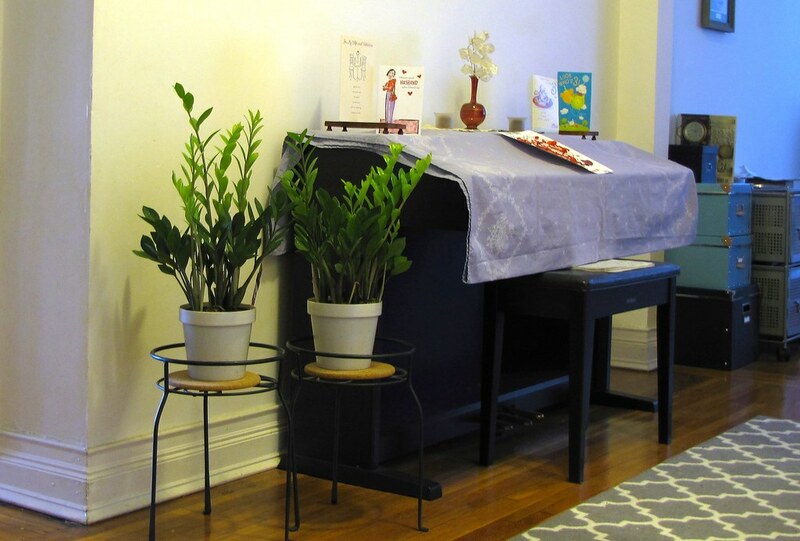 Some compared the ZZ plant to a waiting room or office plant (which indeed it can be). Others complained that the plant is boring and doesn’t “do” anything except thrive on neglect. Several sites repeated the myth that the ZZ plant could live in a closet. I couldn’t tell whether this was an actual criticism, an ironic joke, or encouragement for the novice. I wasn’t looking for a plant simply to neglect it, nor did I have ample closet space in which to abandon one as an extreme test of its hardiness. I was up for some work, but I did want something hardy. I liked the way the ZZ looked, so I bought two plants. It's been a few months, and I’ve come to love them both. Here are a few things I've learned. Zamioculcas zamiifolia is native to East Africa, from Kenya to South Africa. It’s in the Araceae, or Arum family, the same plant family as the familiar houseplant peace lily (Spathiphyllum cochlearispathum). If and when the ZZ plant flowers, it produces a spadix-type flower similar to the peace lily but harder to see. The ZZ has a reproductive strategy that’s unique among arums: Its fallen leaflets can take root (see Propagation, below). The ZZ plant’s scientific name is based on its resemblance to certain kinds of cycads, ancient plants that predate dinosaurs. (True cycads can be seen in BBG’s Steinhart Conservatory.) In nature, it can be found in grasslands, along riverbanks, and in dry forests. ZZ plants grow potato-like rhizomes underground for storing water, a trait that likely helps them persist in times of drought. It’s true that ZZ plants have become popular because they’re tolerant of many conditions. They do well in low light and don't need frequent watering. In fact, you should avoid watering them too much altogether. I water mine about every three weeks, and even then I'm careful not to soak the soil or leave the plants in standing water. My ZZs can definitely sit in dry soil for a while. I bought my plants at a big-box home improvement store. They were in six-inch pots and cost around $12 each. The pots appeared to be from different suppliers, and the plastic plant labels contradicted each other: One label specified "low light"; the other said “bright light” but also "easy to grow." Most sources say one of these things: Avoid direct sunlight; place in indirect light; tolerates low light to filtered shade (though may grow slowly). Here’s what I do: I move the plants back and forth between a windowless foyer space (where guests can see how great they look upon entering our apartment) to an area of north-facing, indirect light. If I forget to make this daily move, I don’t freak out, because I know the plants will be fine. I’ve even gotten some new growth lately. So far, my plants have not attracted pests, and I haven’t had them so long that they need repotting. I found plenty of detailed information on propagating ZZ plants online for anyone who wants to have more. The two methods are dividing (essentially splitting the plant in half) or leaflet cuttings. (An entire stalk, including the leaflets, is considered one leaf.) It can take a few months for a cutting to sprout. My plants came with some inserted cuttings; this may be how the suppliers grew the plants. 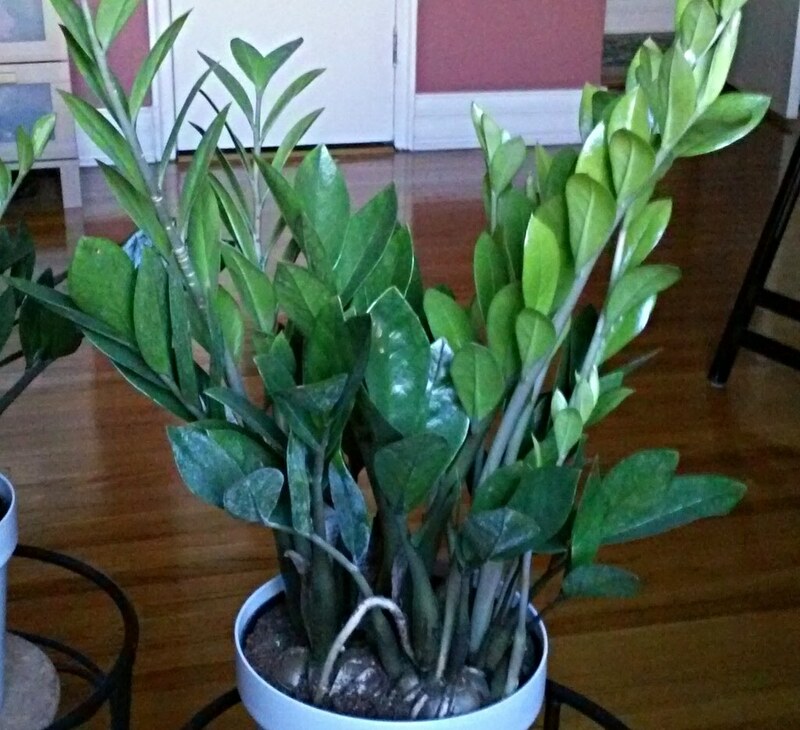 The ZZ plant is turning out to be a great starter houseplant for me. After a few months, both of mine are alive and well, and even thriving in their subtle way. I love their cycad look, which sets them apart from other houseplants. In particular, I like the way their smooth, glossy green leaflets start close to the soil and run up both sides of the upright leaf stems. I’m even seeing some new growth unfurling, giving the plant a two-tone look. I’m not sure what my plants will look like in a year—chances are they won’t have changed dramatically. But if you’re searching for a reliable, unfussy houseplant with a somewhat exotic appearance, look no further than the ZZ. Lee Patrick is an exhibit developer and former botanic photographer for BBG. I have a small zz plant which recently put out a new shoot with leaves not yet unfurled. Really like this plant ! 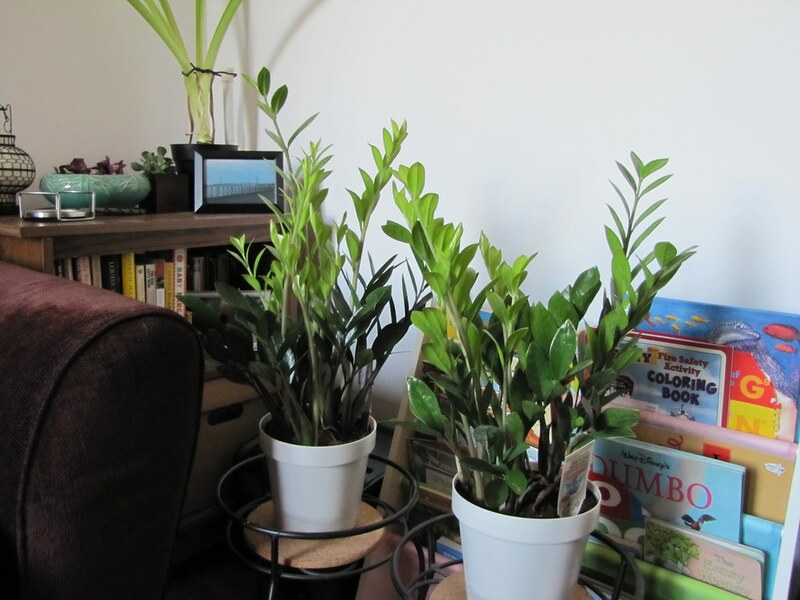 Hi Amy: ZZ plants (Zamioculcas zamiifolia) are known for growing in very low light conditions inside homes, but they are said to grow faster with brighter light (but not direct sunlight). You might also try low doses of time-release or liquid plant fertilizer higher in nitrogen than potash. Look for an N-P-K number like 10-0-0 or 7-2-2. Nitrogen encourages foliage growth while potash encourages blooms. You can also trim the flower stalk (peduncle) off as soon as it starts growing, in hopes of rerouting the plant’s energy to producing taller foliage rather than flowers. In the meantime, enjoy the flowers on your plant while you have them! ZZ plants do not commonly bloom indoors. My ZZ plant is over 7 years old. For The last 3 years it has flowered over and over (about 8 times) but has had no new leaf growth. I can’t find any information on in what conditions it flowers versus in what conditions it grows new leaves. Any ideas about what to do to encourage new leaf growth rather than flowering? Wonderful article and photos, Lee. I’ve just ordered my first ZZ plant—just found out about them yesterday—and am excited about seeing how it will do in a darker corner of my living room. I had an aspidistra there, but it slowly declined, so I may try your idea of rotating to a brighter place. The ZZ plant (Zamioculcas zamiifolia) has potato-like rhizomes that store water and help weather drought. Photo by Lee Patrick. The author's ZZ plants (Zamioculcas zamiifolia) in his windowless foyer. Photo by Lee Patrick. The author's ZZ plants getting their daily sun bath. Photo by Lee Patrick.